More details about the new ASRock Vision 3D HTPC are available. It will be equipped with either an Intel Core i7 / i5 / i3 mobile processor, 4GB of DDR3 RAM, 2.5″ HDD, USB 3.0, memory card slot, Gigabit Ethernet, 802.11n Wi-Fi, 7.1 channel THX certifiied audio, HDMI, and an optional Blu-ray drive. Another interesting feature is possibility to use iPhone or iPad Touch as a motion controller similar to the Nintendo Wiimote thank to the company’s new AIWI utility. Also the HTPC will come with Windows 7 Home Premium pre-installed. There is no any information about availability and price of ASRock Vision 3D HTPC. Demo video of ASRock Vision 3D HTPC and AIWI utility after break. ASRock recently announced its new product – Vision 3D HTPC. It supports 3D thanks to NVIDIA GeForce GPU and sports USB 3.0 port, HDMI 1.4 out, 7.1 audio and Blu-ray drive. The Vision 3D HTPC looks like Mac Mini except the front panel. Vision 3D HTPC has there USB ports and cardreader (personally I like Mac Mini clean front panel much more). ASUS introduced the first networked media player with USB 3.0 support. 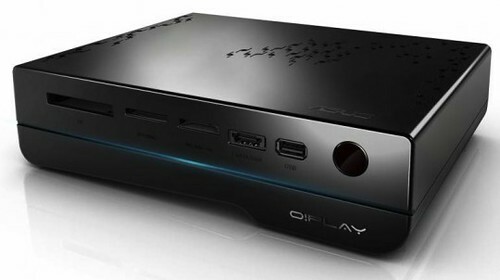 Its new O!Play HD2 additionally is equiped with HDMI 1.3 as well as with Composite, Component and Optical outputs, USB 2.0 and eSata ports, card readers for CF, SD, and Memory Stick and, of course, USB 3.0 PC link. That player together with Seagate BlackArmor PS110 should demonstrate the USB 3.0 power. Unfortunately there is no any words about date availability and price of O!Play HD2.